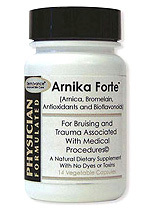 The Arnika Forte capsule formulation is the only product on the market that contains both Arnica Montana and Bromelain. The Arnika Forte capsule can cut recovery times by as much as half and has been proven to be an effective anti-bruising and anti-swelling agent for patients recovering from injectable treatments and surgical procedures. The ingredients are all natural (100mg Bromelain, 100mg Arnica Montana 30x, Bioflavonoids, and 240mg Vitamin C) and no side effects have been reported from those using the product. Take one capsule twice daily starting two days prior to a surgical procedure and one day prior to BOTOX injections or injectable fillers. To learn more about the all-natural recovery supplement, contact San Francisco facial plastic surgeon Dr. David Kim. Schedule a consultation by calling 415-773-0800 or by emailing our office today.